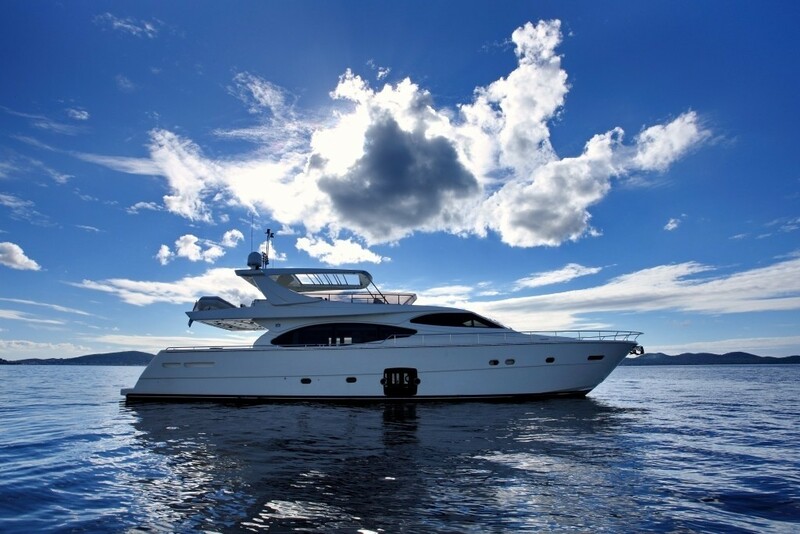 Motor yacht ENA was designed by the in-house Ferretti team in collaboration with Italian Zuccon International in 2008. 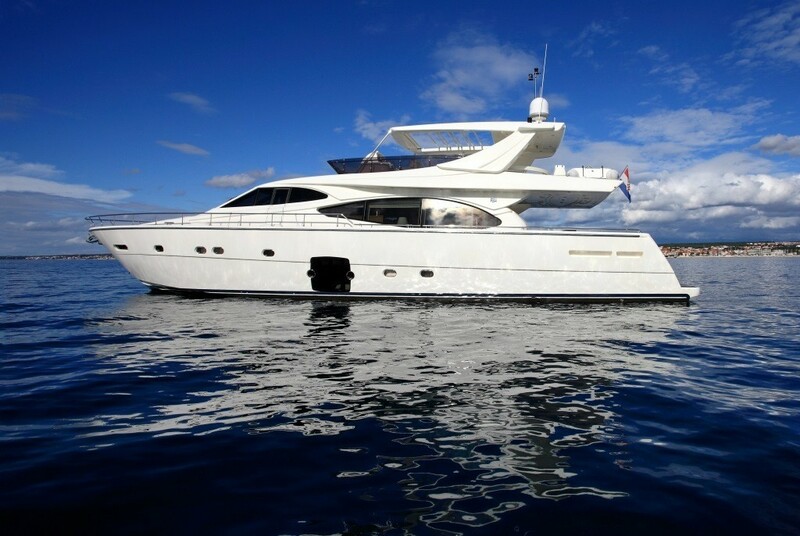 Measuring 24.05m (78.11ft), M/Y ENA is a Ferretti 780 model that offers private crewed yacht charters in the popular after location of Croatia and the Adriatic Sea. 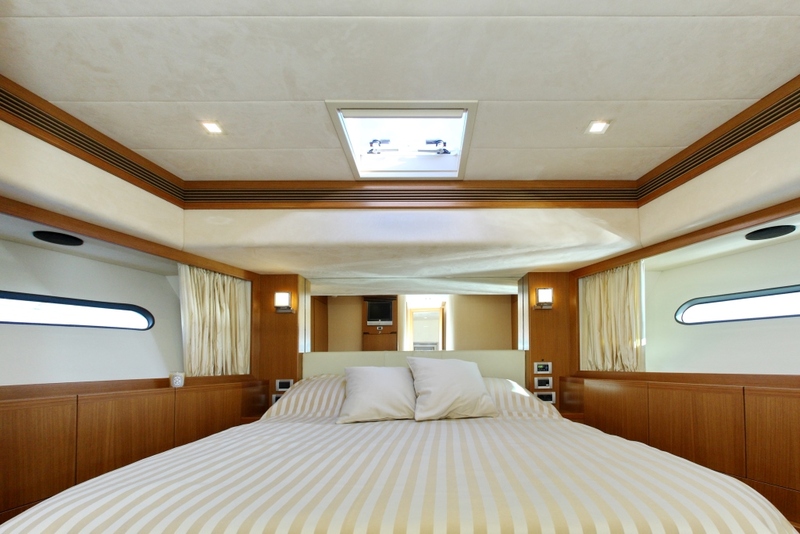 The ENA motor yachts interior décor is a contemporary neutral tone, with light creams, whites and warm honey woods. The salon features a generous lounge with sofas and loveseats, surrounding a unique glass coffee table, creating a truly social ambaince. A drop down compartment stores a large flat screen TV, ideal for catching up on your latest programs. Forward, the formal dining area is raised, allowing a slight separation from the lounge, yet retaining the modern open plan feel. A large flat screen TV is available forward, ensuring guests full TV access from all points in the salon/dining. 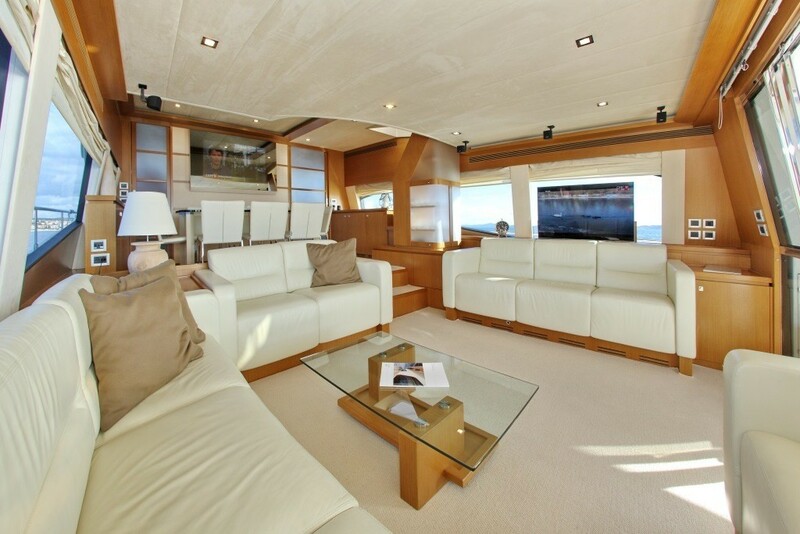 Panoramic windows in conjunction with wide aft sliding doors, provide ample natural light and optimum views. 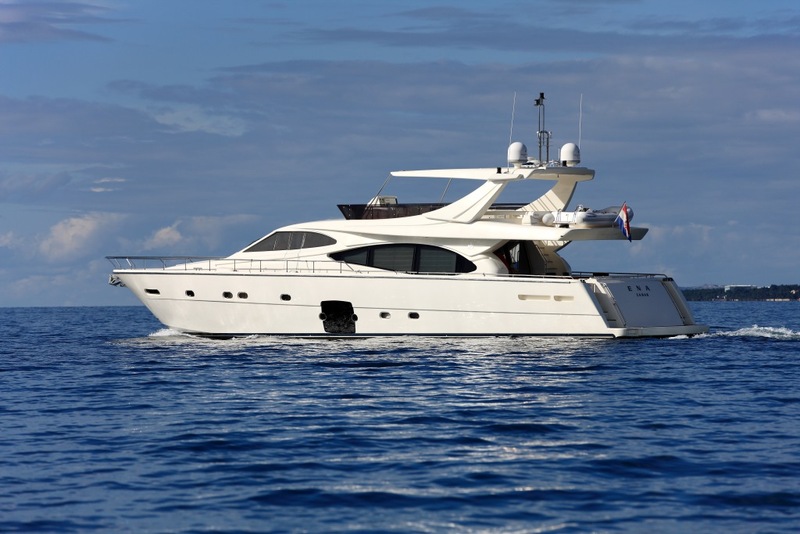 Yacht ENA boasts the well renowned Ferretti’s sleek lines and plentiful exterior living spaces. 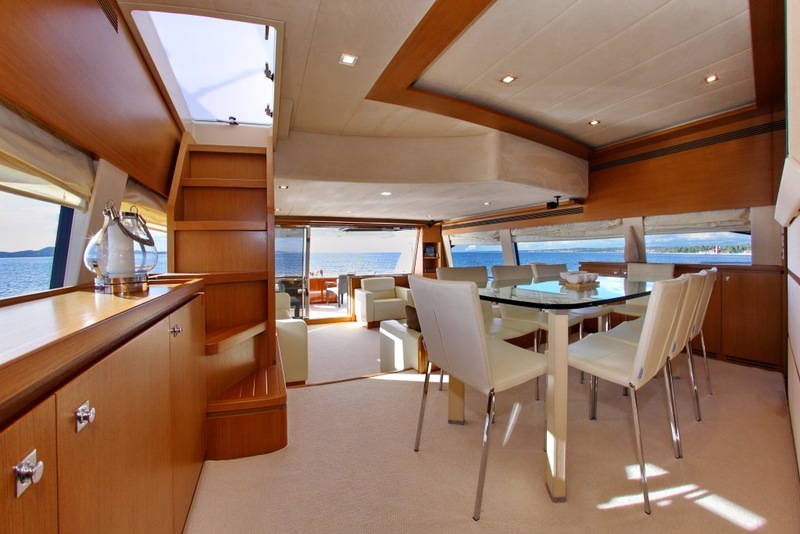 The aft deck is perfect for entertaining, offering a large shaded area, alfresco dining and seating. 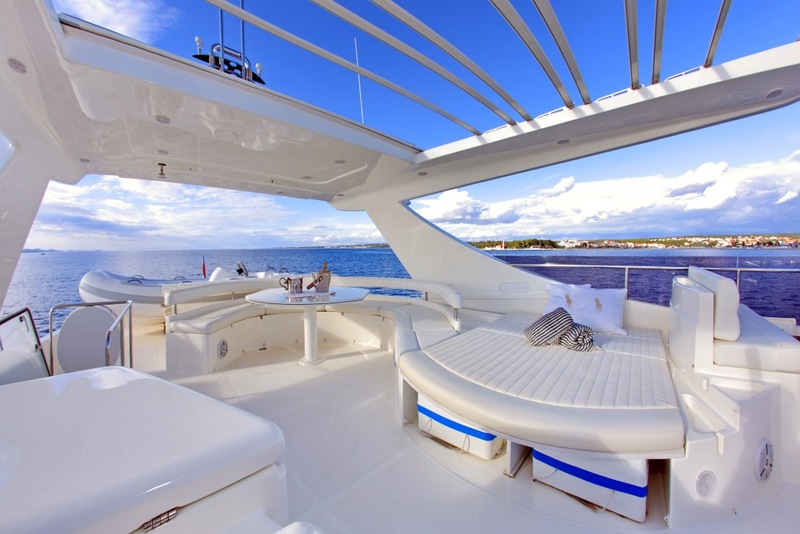 Further aft, the full beam swim platform allows for effortless water access. 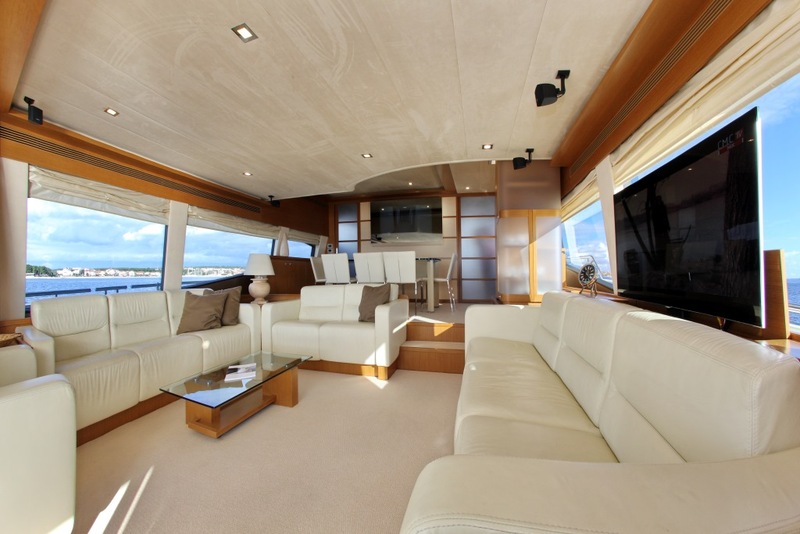 The main deck wraps around the yacht, providing 360° access. 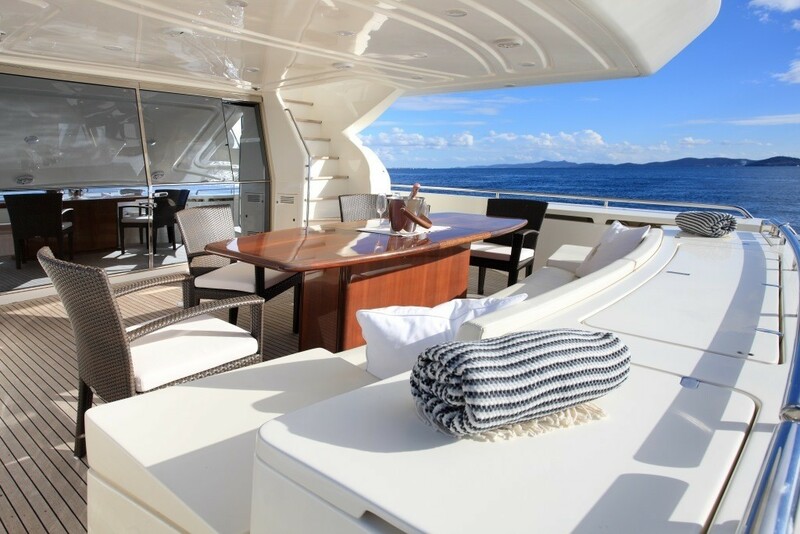 The upper flybridge deck is well-appointed, complete with an alfresco dining option, double sunpad, wet bar and retractable roof. 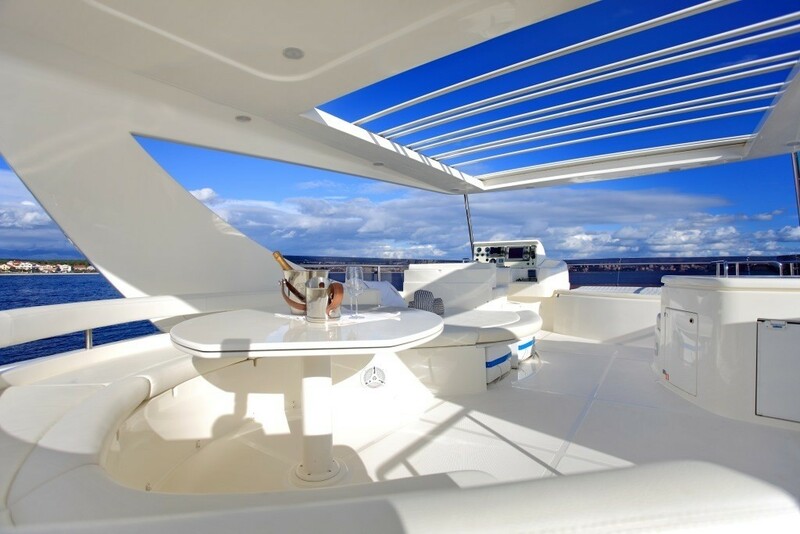 With access from the salon and aft deck, the upper deck is great for any occasion, from a casual lunch to spectacular romantic evening. 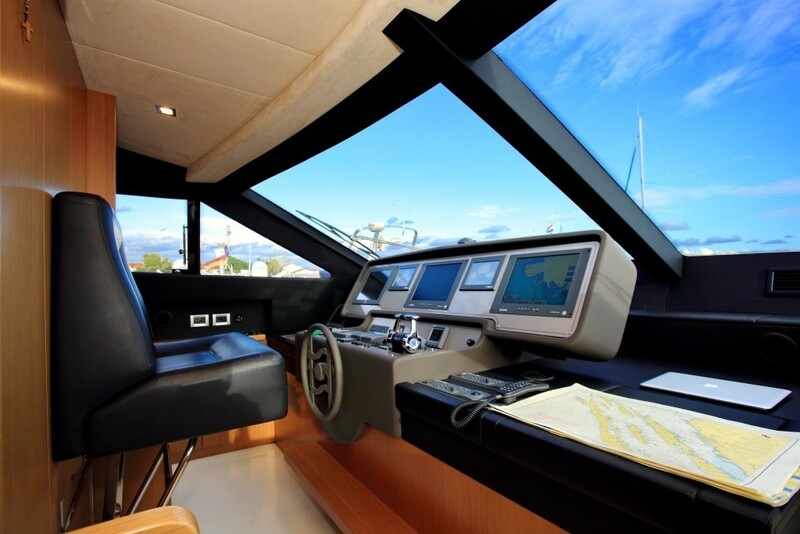 Powered by 2 MTU engines, crewed charter yacht ENA is capable of 25 – 33 knots. 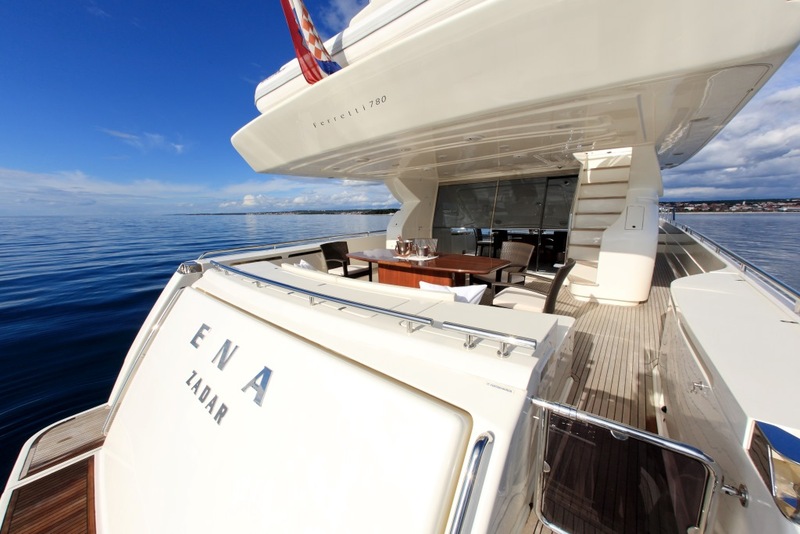 ENA features at anchor stabilizers for optimum comfort. 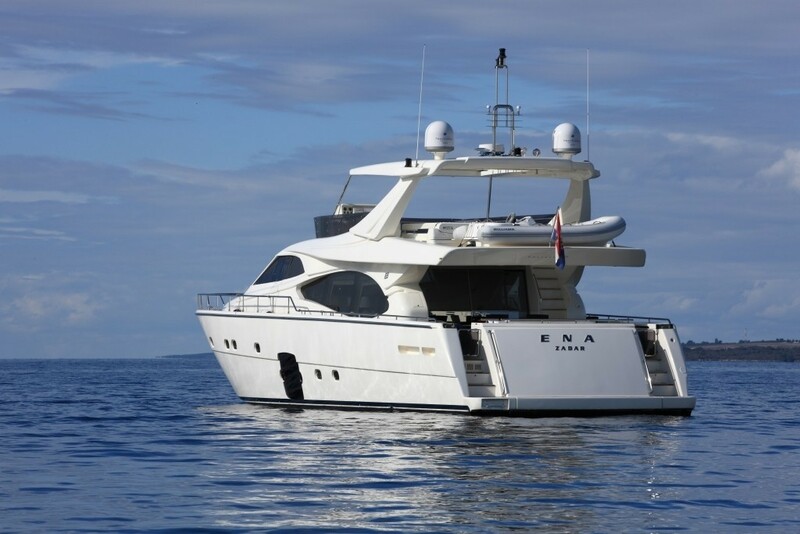 Luxury yacht ENA can accommodate up to 8 charter guests, in 4 en-suite cabins. 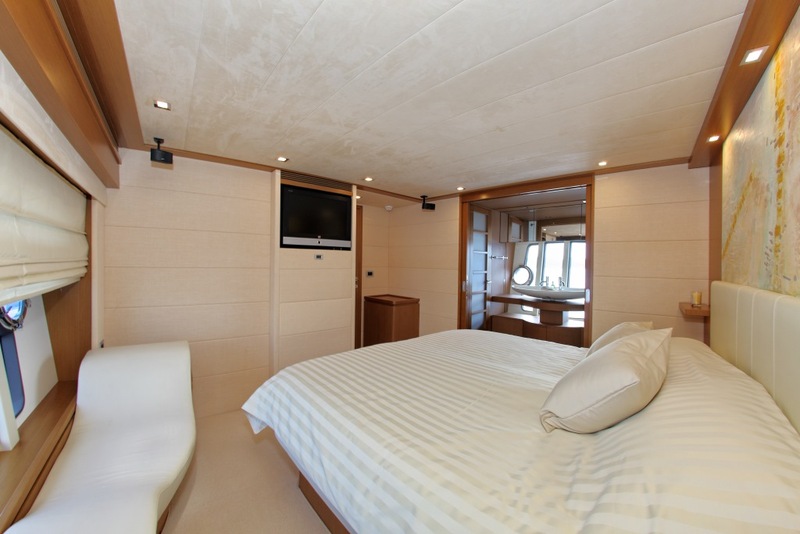 Each cabin is light and airy and boasts TV entertainment. 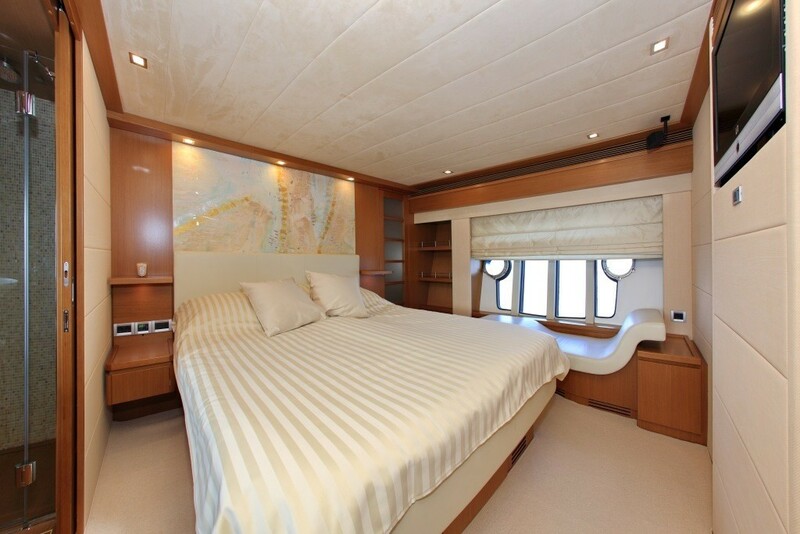 The master stateroom is amidships and full beam of the yacht with a king size bed, built in chaise, generous en-suite and large hull windows, on both port and starboard. 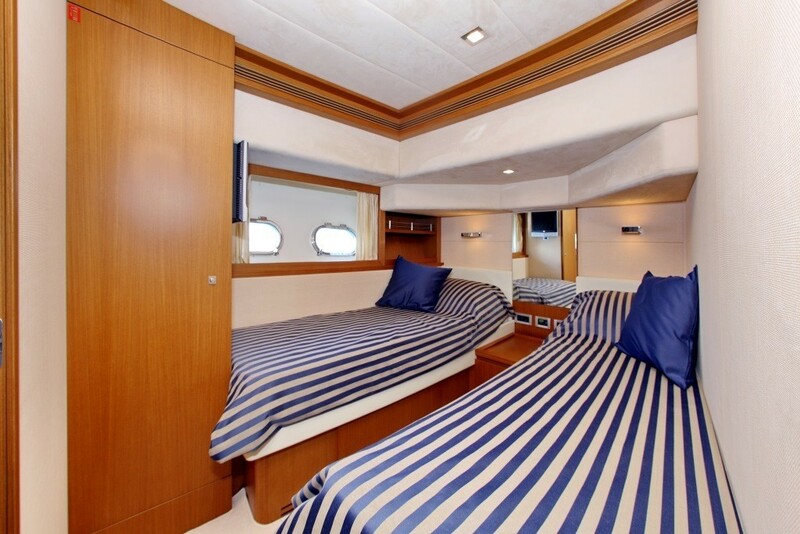 The VIP cabin is forward and full beam of the yacht, with a queen size bed. 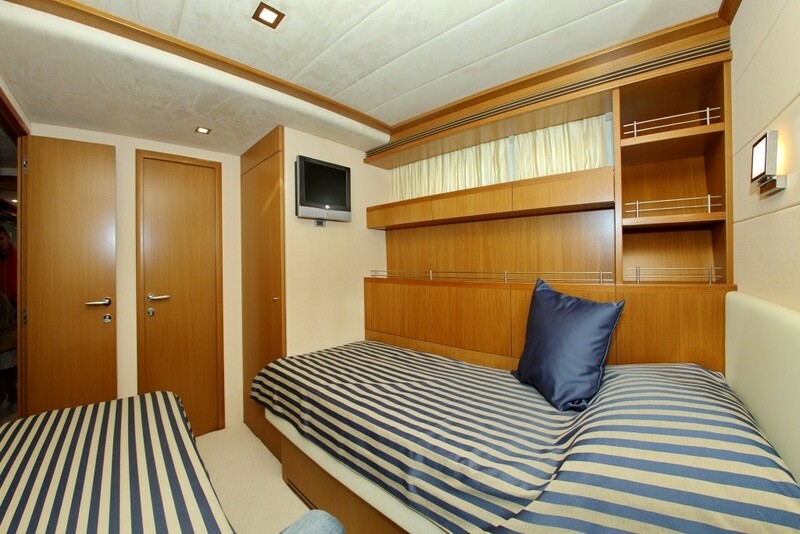 A further 2 guest cabins offer side by side twin beds.